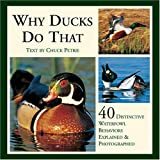 Questions on the behavior of waterfowl are answered and illustrated by color photos. An easy-to-use introduction and ID guide. Includes all North American ducks and geese. With a "What to Look For" list for each species.